This journal publishes articles describing methodological and technological advances that contribute significant progress toward the application of theory and practice of simulation modeling. 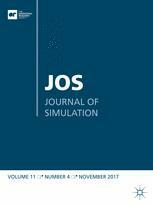 The Journal of Simulation presents theoretical papers that range across the entire simulation process, including modeling and analysis methodologies. The content also includes practical papers describing simulation applications in mainstream industries including manufacturing, defense, health care, as well as more uncommon applications. An official journal of the Operational Research Society, the Journal of Simulation was founded in 2006. Coverage spans the landscape of commerce and industry, including such topics as hybrid simulation modeling for regional food hubs; limits for real-time simulation of video services over commodity hardware; and simulation optimization in the era of Industry 4.0. The healthcare world is accorded considerable coverage, including such topics as simulation analysis of intensive care unit reimbursement policies; simulation in capacity planning in community care; and predictive modeling of telehealth system deployment. The journal also explores practical topics such as myths of revenue management.